BSNL is one of first and leading mobile operators in India which are providing 3g network through out India. Biggest advantage of BSNL 3g is its widest network spread across whole India. If we compare BSNL 3g with other networks then it scores on them in two ways, First it has maximum area under 3 g network and second, it offers plans at lowest prices in 3g. It is easy to find many economical data plans on BSNL 3g service. At present they are offering 1250 MB 3g data for Rs 225 only and 2500 MB data for Rs 360 only. In last few months, BSNL has reduced prices of its 3g service by more than 75%. 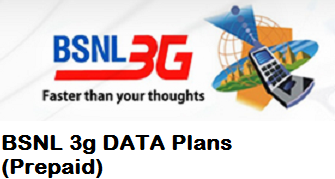 Below, you can find complete detail of all available BSNL 3g Prepaid Data plans. These plans are available through out India; however, still you can confirm with BSNL customer care number 1503 for any variation in your state. To Get desired data plan, you are required to make recharge with amount mentioned in front of it.